Photo kindly provided by Svenja; do not reproduce. 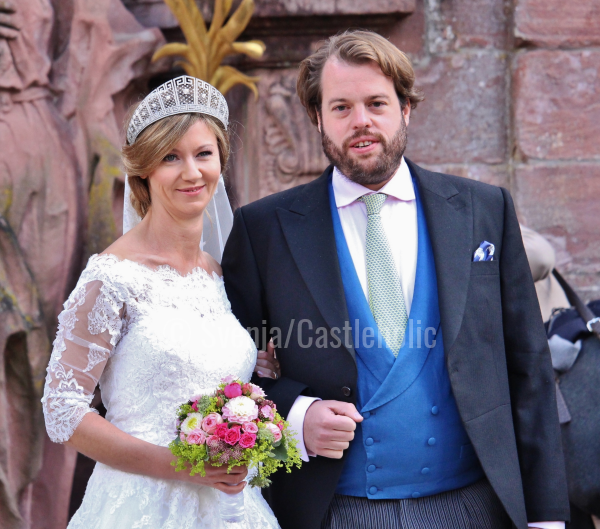 This weekend, two descendants of the former royal families of Germany were married in Amorbach, and a major royal tiara was included in the celebrations. 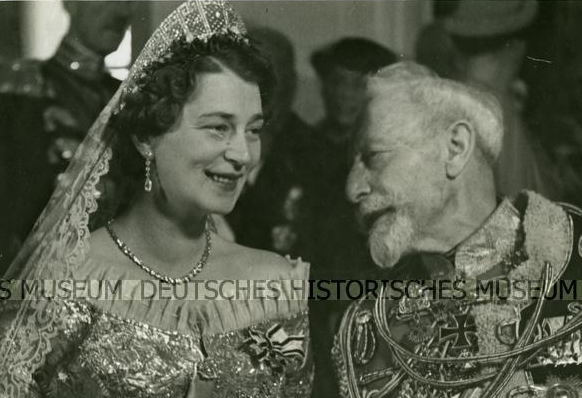 The wedding was a rare union between members of Germany's former royal families: Viktoria Luise of Prussia, daughter of Friedrich Wilhelm and Ermengard of Prussia, married Ferdinand of Leiningen, son of Andreas and Alexandra of Leiningen. Ferdinand's father is the head of the House of Leiningen; his mother is the younger sister of Ernst August of Hanover. Viktoria Luise's father was the eldest son of Prince Louis Ferdinand of Prussia, the son of Germany's last crown prince, and Grand Duchess Kira Kirillovna of Russia. Both Viktoria Luise and Ferdinand are great-grandchildren of Grand Duke Kirill Vladimirovich of Russia and his second wife, Princess Victoria Melita of Edinburgh, and both are also descendants of Queen Victoria. 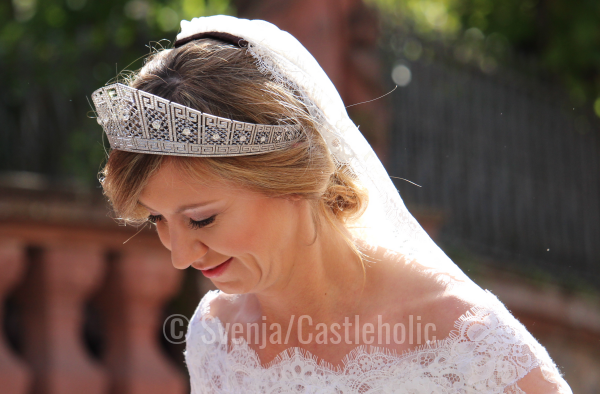 For her bridal diadem, Viktoria Luise wore one of the heirloom tiaras from the Hohenzollern collection: the Prussian Meander Kokoshnik. The tiara was made in 1905 by Koch as a wedding present for the bride's great-grandmother, Crown Princess Cecilie. 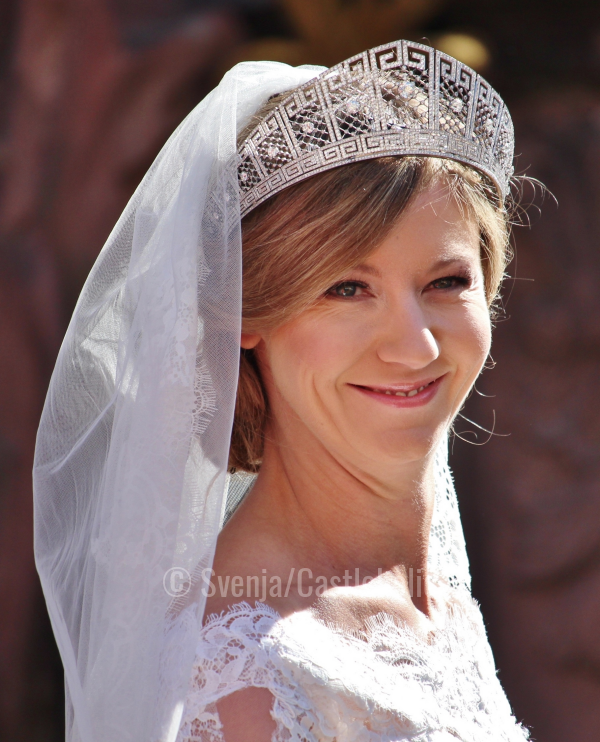 I love seeing the kokoshnik as a wedding tiara -- it's a personal favorite tiara of mine. But I think the tiara would have been a bit more flattering on Viktoria Luise if she had worn it further back on her head. It's an imposing piece of jewelry, and it almost overpowered her. Here's one more view of the tiara that underscores the size of the piece. When worn at a certain angle, the kokoshnik provides a sort of halo of diamonds for the wearer. And here's a look at the entire wedding gown, plus the happy couple! 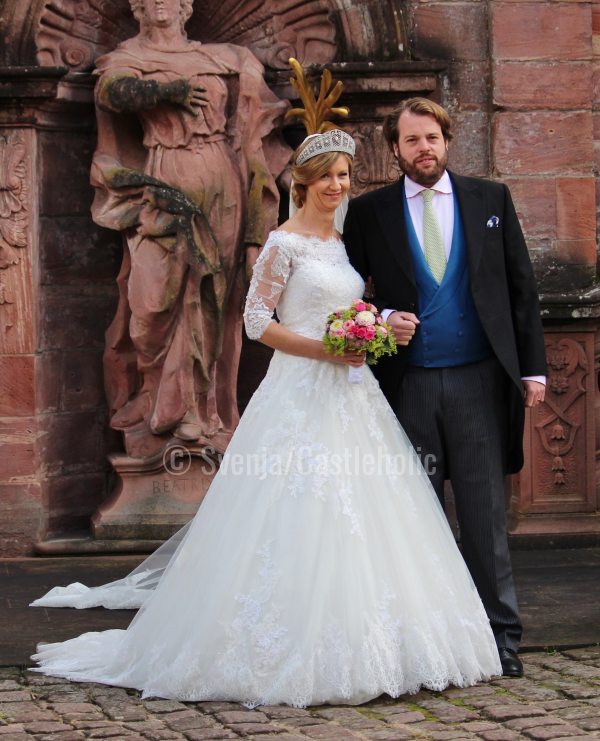 Major thanks to Svenja from Confessions of a Castleholic for providing us with pictures from the wedding! She was able to travel to Amorbach herself for the celebrations -- don't forget to stop by her blog for more photos, including images of the wedding guests!